The rooms available are listed below, along with capacity of the room, contacts name and which staff have access to the room. 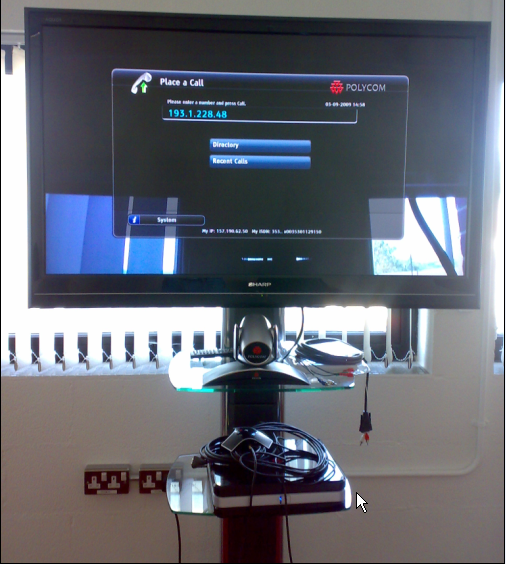 The new High Definition Video Conference system is located in the meeting room of the Tourism & Hospitality building on the 2nd floor of the building. This is a room dedicated to Video Conference calls. The unit is better quality than the unit in the President's conference room; however, it is very similar to use. Attached here is a manual for using the controls on the Video conference unit. For more detailed information on the IP address of the system, dialing other countries, dialing over ISDN and multi-call dialing please click here. The photo above shows the HD TV, below which is the camera. Below this is the HD VC unit. 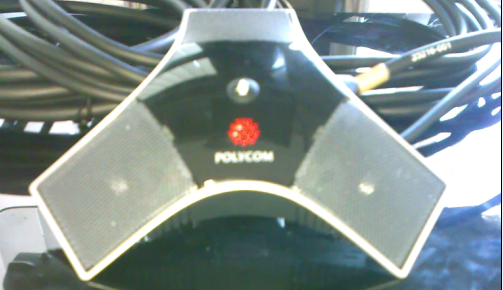 On top of this is the attached microphone which can be relocated as required. There is a square power button on the VC unit that allows power to this unit and to the HD TV. 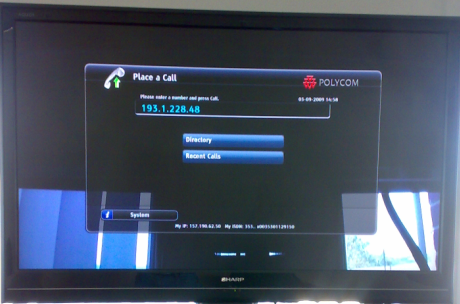 The HD TV can be switched on via the topmost button at the right hand side of the TV. The main control keys for the VC, camera and microphone are located on the upper section of the VC remote control. By selecting the directory list via the central round button on the remote you can then use the right arrow to go over to the list that is displayed and then scroll up or down it. Alternatively, by keying in the first letters of the destination name on the line in the top left keyboard section on the screen, the matching list names will be displayed on the right. To key in a manual entry, press the home key on the remote. IP destination entries can be manually entered by deleting the current entry and inputting the numbers of the desired IP address, including the dots. A voice confirms the key stroke. When the entry is correct, press the green button on the remote to initiate the call. The red button terminates the call. The local camera (seen above) can be controlled by pressing the near button and using the arrow keys on the remote. There is a small delay between pressing the button and the camera reacting. The distant camera can be controlled by pressing the far button and then using the same arrow controls. An icon on the screen will appear depending on which camera control is activated. 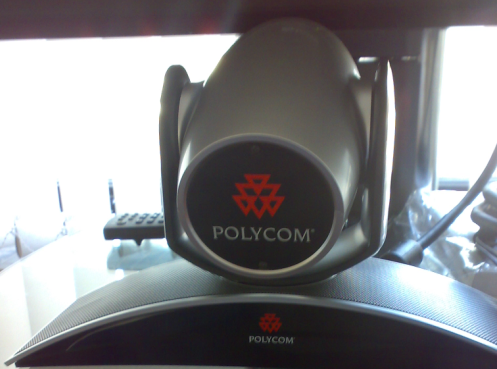 For privacy the local microphone (see across) can be muted by pressing the red mute button on the remote (a symbol of a microphone with a line through it). On the main screen, the Options link at the bottom left allows you to add single or multiple entries into the directory list for future use. 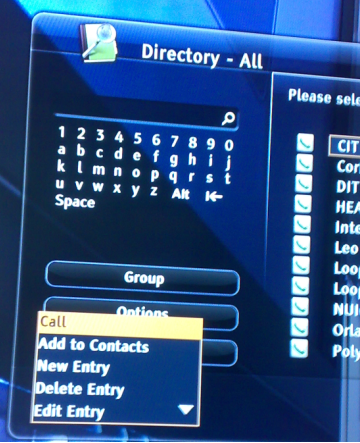 The top line in the entry menu is for the directory name. The IP address is added further down. Most other items are default. You can use the down arrow to scroll and save the entry. If there is a need to join a multi party VC call this is most likely hosted through the HeaNet MCU by a chosen party. 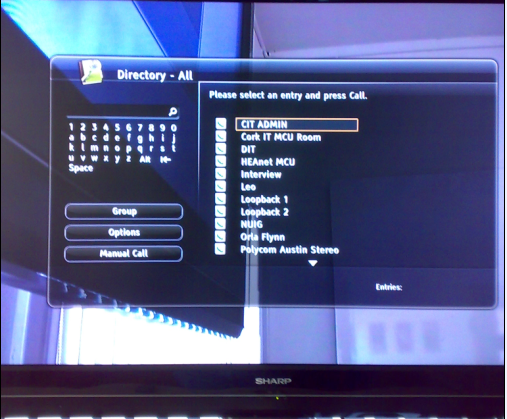 In this case, if CIT is not the host room, choose Hea MCU from the directory and press the green call key. If you know the room number you have to join, hit # then the room number and then # again. A voice will tell you to use the ‘pound’ key. If you are successful you will know when you have entered the correct ‘room’. The ‘room’ can also be chosen from a presented list. To access this hit the right arrow key and then the far camera key. Then arrow up or down the list which is presented in alphabetical order.